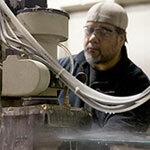 Peninsula Glass is located in Vancouver, Washington. We specialize in replacement houseboat windows, marine window restoration, aluminum boat windows, and sliding boat windows. Peninsula Glass was originally located in the Peninsula area of north Portland. The Peninsula neighborhood of Portland is a beautiful area with well-maintained modest homes, tree-lined streets, interesting shops, and a long history of proud, hard working people. Tom Kemp purchased the company in 1998. He is a native of Portland, and a graduate of the University of Portland, which ironically is located in the “Peninsula neighborhood” of north Portland. Under his leadership Peninsula has continued to reinforce its position as one of the highest quality manufacturer of RV windows, classic auto glass, marine windows and boat glass replacement in the country. Much more than just a glass shop, we have grown a national presence in tempered glass and high temperature glass sales through www.onedayglass.com, the marine windows and boat glass replacement through www.boatwindows.com and continue to show strong growth in the uber-competitive marketplaces of boat, recreational vehicle, commercial and specialty vehicle window fabrication. Our manufacturing facility boasts a fully integrated approach to window fabrication. The heart of the plant is a unique vertical tempering furnace. We also have a precision waterjet cutting system, an extensive array of glass processing equipment, insulated unit production, extrusion bending and forming machines, and the best craftsmen in the business. Our experienced engineering team consistently provides innovative and practical solutions for our customer’s marine window and glass requirements. Peninsula Glass is a fully integrated manufacturer – Our facility includes a unique glass tempering furnace, an extensive array of glass processing equipment, insulated unit production, extrusion bending and forming machines, and the best craftsmen in the business. Our Experience – Our experienced engineering team consistently provides innovative and practical solutions for our customer’s window and glass requirements. We are large enough to serve your needs, but not so large that we have lost the “personal touch” when helping customers.